Gongura is also known as red sorrel leaves and gongura pachadi is very famous in andhra cuisine.Gongura is also knowns as puntikura,sorrel leaves,ambaadi,pitwaa,pulichakeerai,nalitaa saga and pandi.Most famous is gongura pachadi(gongura pickle) and gongura mamsam (Gongura mutton).Other varities are gongura kheema,gongura pappu (Gongura dal) and gongura royyalu (gonruga prawns). 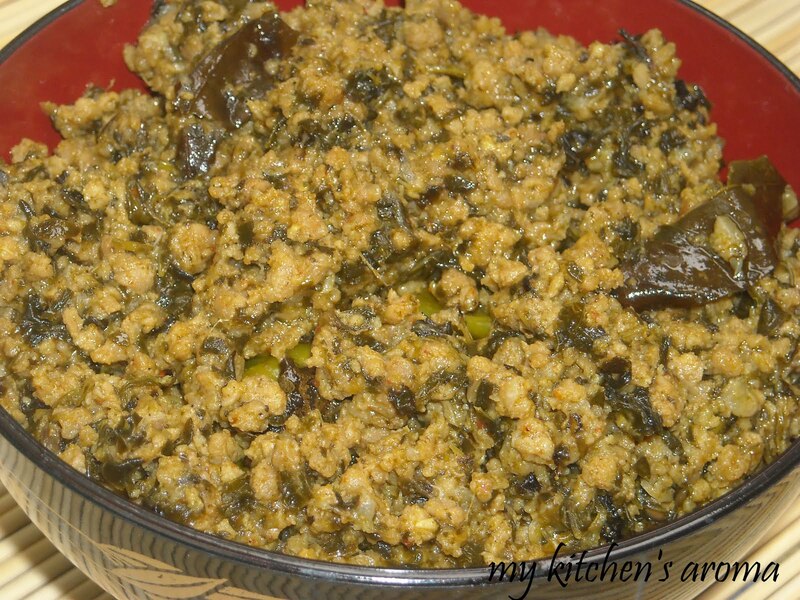 I usually pick 3-4 bunches of gongura every time i see them at the market.With that i make pickle,dal and kheema/mutton.We just love the taste of gongura.I always have gongura pickle in my fridge,when it gets over i buy priya gongura pickle.Will be shortly posting gongura pickle as well. Take 2 tbsp oil in a pressure cooker.Add cumin seeds.When they splutter add the onion paste. Fry till the onion leaves the raw smell and it is well fried. Then add ginger garlic paste.Again saute till the ginger garlic paste is well fried and leaves the raw smell. Add turmeric powder,red chilly powder,garam masala powder and salt. Now add kheema and mix thoroughly.Add enough water and pressure cook until you get 3-4 whistle. In another pan take 1 tbsp of oil and add curry leaves and red chillies.When they are fried add crushed garlic. Saute for a while and add chopped gongura.Fry for 10 minutes.Water is not needed here. Then add the cooked kheema along with water.Mix thoroughly and cook till the water get dried. Serve hot with rice or with roti. 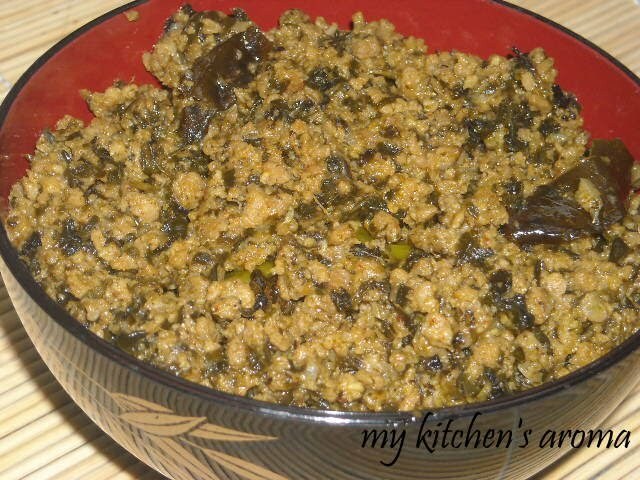 This keema luks very tempting but not sure bout the leaves u hv used...need to google it. gogura keema looks delicious..we love gongura leaves but here hardly we can find in any shops..so always buy the gongura pickle.. This is a new twist. Must be spicy and tasty. Haven't had the luck to find gongura in the markets in my part of the world. I miss it dearly! Happy Mother's Day, dear. Thats an interesting combo' absolutely love it. very detailed and enthusiastic post! will try this recipe today - I am sure my kids will love it on this chilly winter afternoon. Hi Nafis, i never tried using gongura pickle with mutton. But the taste will be different if you use gongura pickle instead of gongura the reason behind to make pickle we add red chillies,garlic,hing etc which we don't use when we make gongura mutton. To get the taste of authentic gongura mutton use only fresh gongura. Hope this helps.